Just for a moment as I looked out my window this morning the sky was pink and blue and beautiful. Now I can still call it beautiful as I mourn the passing of pink and wait for the light of full sun – the promise of the meteorologists for this day. But my enthusiasm is tamped down a bit by a tiny ache in my heart, the same one that soars with the wonder of sunrise but today makes me long for the mountains and faces of Peru. Strange that ten days of immersion in a far-away place could be so deeply planted just by the smiles of children or the grandeur of mountains. But it is clearly there, as firmly as the loyal tree that graces my window, and just as still. I need to shake off the lassitude that comes with travel and get back to the work-a-day world that fills my life with meaning. I know I will but also am confident of a larger stretch of life outside my window that I take to all the days to come. And I wouldn’t have it any other way. I was three weeks old when I was baptized into the worldwide communion of Roman Catholic Church in the “lower church” (undercroft) of Our Lady Help of Christians with my father and godparents (and maybe a few others) in attendance. Thinking about that this morning on this feast of the Baptism of the Lord made me reflect on how the ritual and understanding of baptism in our Church has evolved even in the span of my lifetime. Taking it all the way back to Jesus, it’s interesting to read all of the canonical gospels as they differ slightly, especially in the role of John, the Baptizer. John, the one we call the “forerunner” is very popular in his preaching and draws large crowds when he preaches, usually close to some body of water, his purpose to invite people to immersion which symbolizes being washed clean of their sins. Some think he is the long-awaited Messiah, but he says no to that, promising that the one they are waiting for is much greater than he, whose sandals he is not even worthy to loosen. 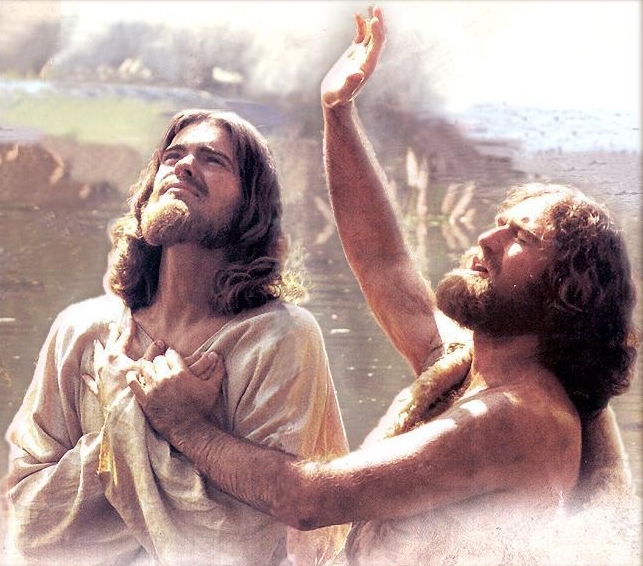 So humility is the order of the day when Jesus arrives asking humbly for baptism and John, recognizing him, saying that Jesus should be the one baptizing him. The ritual still has that flavor of humility, seen most clearly when the candidates are adults who bend their heads over a font or plunge themselves into a pool to be cleansed of sin and live a new life. Now, however, the baptism is understood and celebrated as the initiation of a new member into the Christian community and is cause for great joy and responsibility on the part of the members. I am always moved by such celebrations, whether for an adult who has made a conscious decision to embrace the spiritual path to which baptism is the gateway or for the child whose parents and godparents pledge to raise their child in the faith. While I don’t remember the actual event of my own baptism, I do know the seriousness with which my parents undertook my education in faith and the love of God which was the center of their lives. Today then, I bless their memory and offer gratitude to God for all those people who have strengthened my faith and deepened my understanding of life in God and in community. Rejoicing in this truth, I sing with the psalmist: O bless the Lord, my soul! Today we have come to understand that baptism is a significant event not only for the family of the one being baptized but for the entire church congregation as well. There are classes for parents and godparents – often before the baby is born – to help them understand the seriousness of what “initiation into the Christian community” means. On the day of the ceremony many parishes welcome the families at the door of the church before the service begins and have them march in procession with the priest and other ministering participants in the Mass. The baptism ceremony takes place not in private but in the middle of the liturgy and all present are called to pledge their support to the new member. Over the last 25 years, adult converts to the Church are celebrated in the same manner. In his Episcopal congregation, my friend, Father Bill, always wrote a letter to the child being baptized to be kept by the parents to be read when the child was able to understand the love that was present in the baptism ceremony and the support that would be available from the congregation for his/her entire life. The dictionary definition of baptism includes sprinkling or immersion with water to symbolize purification or regeneration as well as initiation into the Christian church, often accompanied by name-giving. I must admit that sometimes it got tedious to grow up being called Lois Lane and asked the whereabouts of Superman, but eventually I “grew into” my name and have come to understand that each of us is called by name in God’s family and as such we respond in our own unique way to God’s plan for our life. When someone we love addresses us by name it has a particular sound, doesn’t it? It’s a wonderful thing to know we are cherished simply by that sound. Today our Church celebrates the feast of the Baptism of the Lord by John when God’s voice is heard from a cloud saying, “This is my son, my beloved, in whom I am well-pleased.” Whatever our faith commitment or practice, might we listen for those words in our own life, (e.g. This is my daughter, my beloved Lois, in whom I am well-pleased.) and renew our resolve to live in a way worthy of the name by which we are called?